In our ever expanding search to replace our dependency on oil, we continue to look to Mother Earth for alternatives. Most agree that renewable and sustainable fuel sources are the best choice, but most recently scientists in Japan have tapped into what is referred to as flammable ice as a potential source to power plants. Deep below the sea floor there a massive deposits of frozen methane, also called flammable ice or fiery ice. The ice contains a number of materials, but the methane gas that is trapped in this ice is what Japanese scientists have used as a potential alternative power source. They refer to this as methane hydrate, and it has been considered the richest source in the world of an alternative fossil fuel. But, before you go making plans to look for methane hydrate to operate your car, keep in mind that this is another fossil fuel and we may be substituting one problem for another. The Japanese are looking for an alternative fuel source to replace their nuclear power plants. It’s already been shown that the locations and stability of these nuclear plants are in question and could cause major devastation if another earthquake reduces the integrity of the plants; as occurred at the Fukushima plant. The scientists are seeking a way to expand what is being called the golden-age-of-gas for a number of additional years. This is not only good for the idea of shutting down the shaky nuclear plants, but good for the bottom line margins of the Eurasia Group of global energy and natural resources. It appears that flammable ice, or methane hydrates are located in vast quantities around the world. Almost all of it is within the permafrost and deep in the ocean depths. Scientists have discovered a huge reservoir under the Alaska North Slope. Based on surveys by U.S. Geological, the estimates for methane and gas hydrates is coming in to between 10,000 trillion cubic ft to over 100,000 trillion cubic ft. This includes both accessible and non-accessible quantities. The non-accessible areas are those that cannot be accessed at prices that would be considered reasonable. Putting it into perspective, you can compare this amount to the U.S. reserves on shale natural gas, which are at estimates of 827 trillion cubic ft. 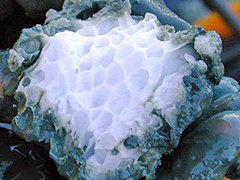 The U.S Geological Survey has reported that the estimates of carbon within the gas hydrates total to more than all currently known fossil fuel reserves. In the past, the problem was trying to access this fiery ice, however, the Japanese Ministry of Economy has released the fact that their scientific teams on board a drilling ship has successfully accessed the methane deposits in fiery ice around one thousand feet below the seabed. Their special equipment drilled, achieved lower pressure which caused the ice and methane to separate and then they piped the natural gas to a surface point. So what does all of this mean? Those that have a vested interest (and that means dollars and yen) are touting the flammable ice as the latest discovery for a more clean energy source. The problem is, natural gas is only cleaner when you compare it to the very worst that we are using now: oil and coal. It’s actually just another fossil fuel, and while available in the trillions, it’s neither sustainable nor renewable. Posted on April 8th under Non Renewable Energy Sources. Doesn’t sound like a good investment to me. Sure, it has that sparkle of newness and hints on saving the planet…but it isn’t and it’s not. Would rather see the money spent on better, smaller and improved solar and wind than flammable ice. Nothing says new business like the thought of flammable ice. That’s humanity for you, take the easy way out, even if you have to work harder for it. Just another replacement for oil. It’s a wonder the oil companies haven’t turned to pulling up flammable ice from the ocean. After all, their game is using and not replacing. Not in favor of all of the money, time and focus being placed on methane ice. We need to find sustainable and renewable energy, not another way to drain the earth of it’s resources. Cool. I wonder when they will have samples available to buy on the market for the rest of us. Would be excellent for parties. Have watched documentaries about methane and its various forms. The ocean is full of the stuff, but then again, that’s what we said about the earth’s oil.